charming place to bring the family or a date. 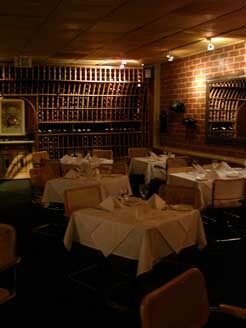 friendly service, and a mouthwatering selection of traditional Italian fare. pleasures of the table play out in unhurried celebration. of friends all chatting away happily within the warm space. of a variety of labels that leans mostly Italian and mostly red. salads, and an absolutely stunning array of pastas and secondi piati. each bite is both playful and elegant, whetting the appetite for more. As if on cue, a basket of complimentary house-made Bruschetta arrives on the table, I love Bruschetta, t is rustic and comforting at once. smoked prosciutto and sliced tomato. Very fresh and light! We loved it. tang of the pasta. This is a dish that is both luxurious and decadent. saute spinach. This is a great dish for scallop lovers! a playful treat that will make you very happy and the Chocolate Soufflé, served with their special homemade ice-cream. we have begun to feel at home. Angelo and his wife truly welcome guests into their family, treating them like close friends for a few hours at a time. For a taste of Italian hospitality and traditional regional Italian cuisine, there is no better spot in Westwood than Ristoranti La Bruschetta.